The Red Sox erupted for four runs in the top of the eighth inning to come from behind and beat the Tigers 7-5 at Comerica Park. The win snapped a two-game Boston losing streak. The game had been a see-saw battle prior to that - every time Boston would score a run, Detroit would score again to take the lead. 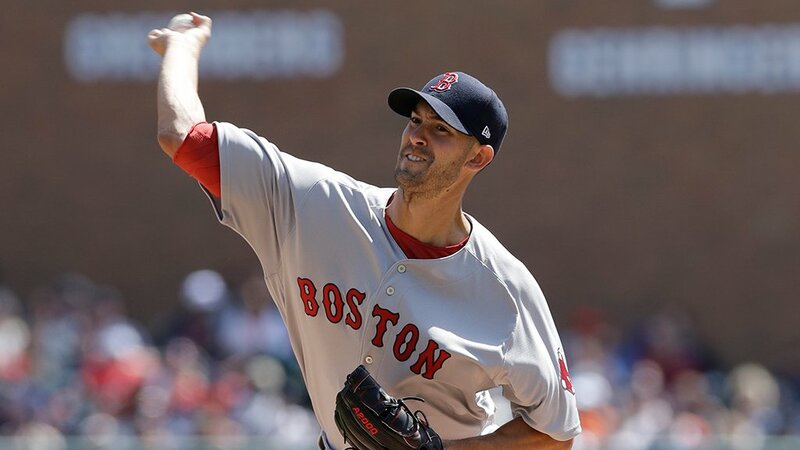 Rick Porcello (pictured) started for the Red Sox and though he clearly labored throughout his six innings, he managed to keep the game close. He allowed four runs (three earned) on eleven hits and one walk while striking out eight. He gave up one home run, a solo shot by Nick Castellanos in the seventh inning. Matt Barnes threw two scoreless innings of relief with three strikeouts to earn the victory. Craig Kimbrel earned his second save of the season despite walking the first two hitters he faced in the ninth. He struck out Miquel Cabrera before giving up an RBI single to Victor Martinez. Kimbrel struck out Justin Upton and Tyler Collins swinging to nail down the win. Chris Young and Sandy Leon each had a pair of hits. Leon drove in two of the four eighth-inning runs.